Structural Acrylic Adhesives | Loxeal S.r.l. Loxeal Acrylic Adhesives are structural Adhesives designed to functionally cure in few minutes with high peel and impact strength. They assure high resistance against chemicals and good resistance against heat. Greatly increase in design possibilities to bond a wide variety of substrates. Loxeal 30-55 is a structural acrylic adhesive to be used with its specific Loxeal Activator, designed primarily for bonding metal to metal, ferrite, ceramics and some thermoplastics. This adhesive may be used in a variety of structural bonding applications due to its versatile capabilities. Structural adhesive 30-55 provides high tensile strength while maintaining excellent product flexibility; this results in tough and durable bonds with outstanding impact and peeling resistance. Curing is effected in few minutes at room temperature. Two-components adhesive curing by contact, does not require mixing. Fixture time from 1 to 3 minutes. Suitable for bonding metals, ceramics, glass, wood, hard plastics; it is highly resistant to impact, peeling and tensile. 33-47A may be used also with Loxeal Activators 18 and 20. Two-components toughened low viscosity and low odor acrylic adhesive. Mixing ratio 1:1. Specifically designed for bonding plastics, it provides good adhesion to metals, ceramics, fiberglass, wood and their combinations too. Fast curing at room temperature, it provides high shear and peeling strength. Mixing ratio 1:1. Suitable for bonding metals, ceramics, GRP, wood, hard plastics. Loxeal 3439 is a fluid, 2-component no- mixing fast curing structural adhesive to be used with its specific Loxeal Activator. It bonds ferrites, metals, ceramics. Typical fixture times 20-40 seconds. Toughened, it achieves in very few minutes good shear and impact strengths. Ideal for high speed assembly production lines. Acid free. 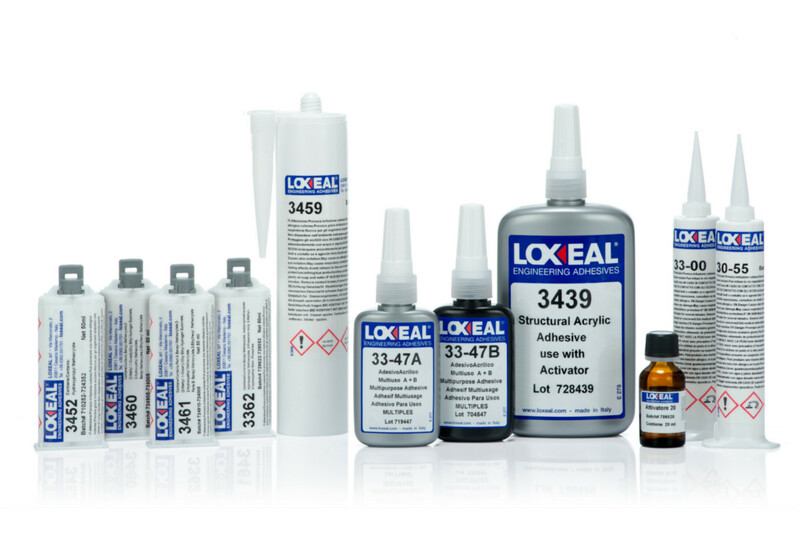 Loxeal 3459 is a 2-component no- mixing fast curing structural adhesive to be used with its specific Loxeal Activator. Gel formulated, toughened, it achieves in very few minutes good shear and impact strengths. Ideal for high speed assembly production lines. Acid free. Two-components fast curing acrylic adhesive, specifically designed for bonding PP, PE, HDPE, LDPE, Polyolefins, copolymers, PTFE, EPDM among them and in combination with other plastics such as ABS and PVC and to metals (aluminium) as well. Does not require any surface treatment. Mixing ratio 1:1. Micro-particles for gap control; fast curing at room temperature, it provides high shear and peeling strength. Two-components medium speed curing acrylic adhesive, specifically designed for bonding PP, PE, HDPE, LDPE, Polyolefins,copolymers, PTFE, EPDM among them and in combination with other plastics such as ABS and PVC and to metals (aluminium) as well. Does not require any surface treatment. Mixing ratio 1:1. Micro-particles for gap control; it provides high shear and peeling strength. Two-components fast curing acrylic adhesive. It is specifically designed for bonding Polyolefins and substrates with low surface energy (PP, PE, PTFE), in combination with other plastics and metals as well. Loxeal AC5465 does not require any surface treatment, thanks to its physical features, it allows to design 0-gap joints and to bond substrates with extremely small gaps. Its application provides a resistant and transparent bonding when used at 0-gap on transparent substrates. It provides high shear and peeling strength. Loxeal AC5000 is a 2-part, toughened acrylic adhesive. It cures quickly at room temperature. Its toughening makes it ideal for bonding dissimilar materials including metals (particularly aluminium), plastics, composites and rigid materials. Loxeal AC5000 is also highly resistant to temperature and thermal shocks. Loxeal AC5002 is a 2-part, toughened acrylic adhesive. It cures quickly at room temperature. Its toughening makes it ideal for bonding dissimilar materials including metals, plastics, composites, ceramic and wood. Loxeal AC5002 is also highly resistant to temperature and thermal shocks. It is provided in an easy-to-dispense cartridge with mixing nozzle or it can be used bead on bead without the mixing nozzle. Loxeal AC5004 is a 2-part, toughened acrylic adhesive. Crystal clear appearance, it cures quickly at room temperature. Its toughening makes it ideal for bonding dissimilar materials including metals (scratching aluminium surfaces is not required), plastics, composites, ceramic, glass and wood. It is designed to ensure transparent joints. Loxeal AC5004 is also highly resistant to temperature and thermal shocks. Loxeal AC5010 is a 2-part, toughened acrylic adhesive. It cures quickly at room temperature and thanks to a delayed initiation, it allows accurate alignment of components. Its toughening makes it ideal for bonding dissimilar materials including metals, plastics and composites. Loxeal AC5010 is also highly resistant to temperature and thermal shocks.